You must start this weeks podcast with a daiquiri. Head over to your bar, cart or booze cabinet and throw together a classic daiquiri on the rocks. Use the Hemmingway recipe or one like it. Not a blended sugary bastardization. Next, find a bottle of red wine. Nothing fancy and best yet, something you already have open and haven't finished. Any red wine will do. When you listen to this episode you will get our details for making impromptu sangria with your wine and daiquiri. Trust us. This works. We also fool around with a home juice brewing kit called Spike Your Juice, turning bottled juice into sparkling wine/cider or whatever you would like to call it. Some of our inebriated conversation could be but is not limited to: Quick discussion of our favorite tiki bar book, The Parrot Talks in Chocolate by Everett Peacock. Cocktail dresses for dogs? yeah! It's a total thing. But should it be? We discuss. There is also a little culture in our banter. Sunshine just purchased a pair of custom painted tiki Van's by Tiki Tony Murphy. Tony has a signature look that is unmistakeable and hard not to desire. Carvings, paintings and more. Take a look at his work and get a little something for your home or bar. A new ZTL tiki mug is in the works. Our friends at PopTiki of Colorado are currently working on a second mug just for our podcast. Check out that sneaky peek of the rear of the mug. Thats all you get for now, other than listening to this episode for more details. And, some rather dirty conversation about the potential name of our latest mug creation. We will be opening up pre sell on this mug for the first few dozen. Please stay tuned for details. You can buy our first mug "Big Orange Richard" here. 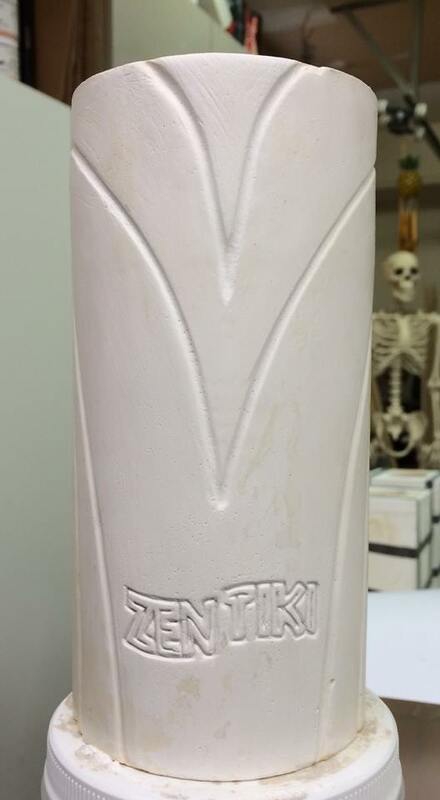 From the workshop of PopTiki of Colorado: First look at a new tiki mug for the Zen Tiki Lounge.